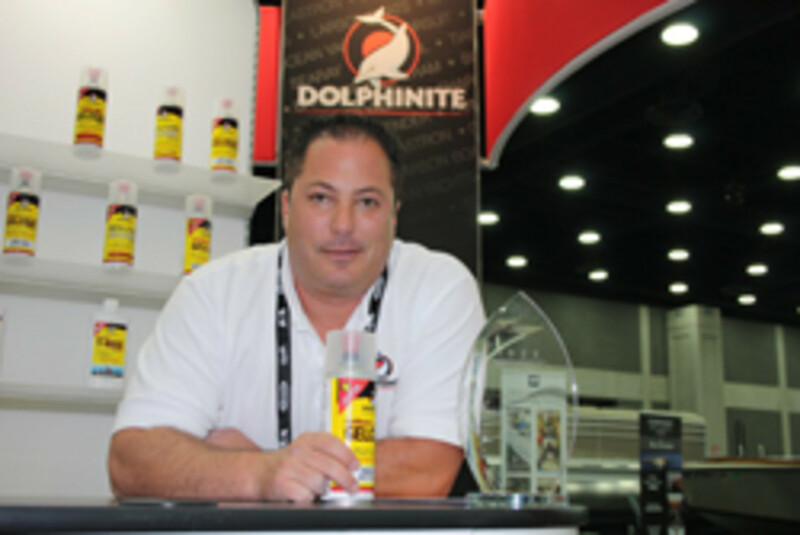 LOUISVILLE, Ky. — Adam Boulay, president and CEO of gelcoat and fiberglass product manufacturer Dolphinite, is having a good year. Nine years removed from shutting down his company after filing for bankruptcy following the failed launch of a faulty antifouling product and subsequent lawsuits, Boulay brought his relaunched Dolphinite to the International BoatBuilders’ Exposition & Conference with a new product and the 2012 IBEX Innovation Award trophy it earned in hand. “People here are calling me the comeback kid,” Boulay said this week from his display on the floor of the Kentucky Exposition Center in Louisville. The award is for GelMatch All In One Gelcoat Aerosol Can, Dolphinite’s “exact color match with spray-gun quality from an aerosol can” product. It was introduced at IBEX last year and is set to hit the OEM, distributor, dealer and consumer markets in about a month, Boulay said. Boulay said his company, which relaunched its website in May, can produce more than 14,000 colors to match original factory gelcoat colors from boatbuilders, including make, model and length year-to-year variations dating from 1984. The Dolphinite all-in-one aerosol comes in a two-component proprietary can with a volume reducer that houses the catalyst in an inner chamber, along with the gelcoat color. Users can cover a minor scratch in the gelcoat of a boat in about three minutes with his aerosol product and save hundreds of dollars, Boulay said. “Not only can a boat owner fix their own boat, they can be confident that the color will be an exact match,” he said. The introductory retail price is $99.95 a can. Click here for the product sell sheet.